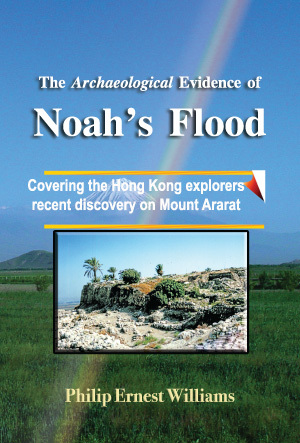 This week Noah’s Ark Ministries International (NAMI) based in Hong Kong announced that they have found what are likely the remains of Noah’s Ark. This is not the first such announcement to be made in recent years. Not surprising, most of the world’s media who covered the latest announcement greeted it with skepticism. One expects unbelievers to be unreceptive of a claim that would so magnificently confirm the Bible against the teachings of modern science, but the most prominently-mentioned skeptics of this latest are evangelicals who also believe in the Flood. Some of the latter have themselves been involved in searching for Noah’s Ark. I too have been involved with this subject – not in searching for Noah’s Ark but in investigating the Flood. This year I publish The Archaeological Evidence of Noah’s Flood from Christian Leaders & Scholars Press to be released October 1, 2010. Previous investigations of the Flood have focused on geological evidence. This is the first study concerned with the worldwide archaeological evidence that might confirm or refute the Flood. Over the twenty years that I spent researching this matter, I have reviewed evidence from thousands of sites from all over the world, a good portion of them dating from 4000-5000 years before the present. 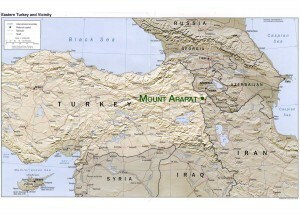 Some of the sites I have looked at are in proximity to Mount Ararat. I have also investigated many modern claims about Noah’s Ark, but I have never been much impressed. While not focusing on searches for Noah’s Ark, my forthcoming book expresses doubt whether the remains of the ark will ever be found. I do not make my judgment of these latest claims without careful and critical analysis of what NAMI has offered. I am not however one of the skeptics of NAMI’s announcement, though I am as surprised by the discoveries as any believer. To be sure, I have been intrigued by this group since their preliminary announcement a few years ago. I have eagerly waited to hear more, which they have just given. Preliminary as it may be, it is far more than anyone might have wished. I believe there is more to come from this group’s discovery. One thing that impresses me about NAMI, beginning with their original announcement, is the involvement of local government, culture, and archaeological officials. These Turks and Kurds have lots of experience in the various searches and claims for Noah’s Ark. Searches for the Ark have become an industry for the locals. The local officials and archaeological establishment would not want to be embarrassed by being associated with fraudulent or poorly-based claims. Prominent Noah’s Ark searchers – including some of the critics of NAMI’s announcement quoted in the media! – have been involved in questionable claims. A second thing that impresses me about NAMI is the straightforward and unvarnished way this group presents their finds. There is nothing slick about what they have done. Their unsophisticated press announcement and web site only makes them the more credible. A third thing that impresses me is that this group delivered the first installment of what one should expect from an initial expedition. We have actual pictures and videos of what is likely Noah’s Ark. The group has given a fair narrative summary of their find. They also describe how their venture developed. They seem people with nothing to hide. Most of their critics probably do not know how important archaeological discoveries are initially treated. Else, they would not criticize NAMI and Turkish government officials for keeping the exact location secret, at least for now. Archaeologist and antiquities officials use the same procedure for almost any important archaeological discovery. They do not want to see irreplaceable artifacts looted or damaged by treasure hunters. Some claim that these discoveries were not reviewed by professionals and peers before making this announcement. Who are the professionals or peers involved with the search for Noah’s Ark? NAMI is working with local archaeological authorities who probably have as much knowledge of this subject as any archaeological group one might be able to find. Many professionals involved with archaeology would not consider being involved with this find. These criticisms have either not been thought out, or they are disingenuous. I note something of the ugly American (or the ugly Westerner) on the part of those who ignore these Turkish officials and Chinese Christians, but quote as authorities critics with questionable or superficial credentials. It is important to keep in mind that many of the critics who have been quoted as authorities are Young Earth Creationists who deny the reliability of radiocarbon dating. They might not like the fact that NAMI has provided the results of radiocarbon dating. NAMI’s radiocarbon tests dates the wood to about 4800 years before the present. I use radiocarbon measurements in my own book to date the Flood. My dates for the Flood are surprisingly close to the one made centuries ago by James Ussher, and printed in older editions of the King James Bible. We should keep in mind that the trees used for constructing the ark may have been growing for several centuries before they were harvested for the ark. I am interested in the results of new measurements made on wood from various parts of this structure. Some critics have claimed that these pictures were made some place other than Mount Ararat. What we see in these videos is a place that is very cold and where the air is so thin some of those pictured are having difficulty breathing. It is a safe bet that these pictures were actually taken some place where the air is thin and cold, I suspect high up on Mount Ararat. The group has referred to their site as a series of caves or openings. That impressed me, even from their preliminary announcement a few years ago. Wooden structures that get buried will appear to archaeologists as caves or shafts. Why should the ark be completely or partially buried? The reason is landslides that have been plentiful on this growing mountain. Fortunately, getting buried is what preserves things this old. That and the extreme cold this far up the mountain explains the excellent preservation. Some have criticized the fact that straw appears in some of the pictures. Apparently without knowledge of their subject, they claim that straw this old cannot be in such good shape. Straw has an excellent chance of preservation, the same as rope, sandals, and clothing found on Otzi the Ice Man discovered a few years ago in the Alps, who dates to around the same time and similarly preserved in glacial areas of the mountains, though a few thousand feet lower than this find. Others have criticized what appears as spider webs in some of the pictures. They claim that spiders cannot live in such inhospitable places, and that the spider webs would not be long preserved. Upon what evidence are these criticisms made? Insects and other life forms exist in the most inhospitable environments. Undisturbed spider webs might hang around for a very long time. Do these critics believe that spiders were never in the Ark? Another criticism of NAMI’s find is a supposedly lack of bitumen on the wood shown as belonging to the ark. God instructed Noah to seal the ark inside and outside with bitumen. Bitumen would have waterproofed the ark as well as help preserve it. Though bitumen is a great coating for a few years, its life expectancy should not be much longer than the lifetime of a thick coat of paint. We must wait for test to determine whether the timbers of this ark show any evidence of having been once coated. Students of Noah’s Ark have recognized that it would be difficult to explain away such a find as this, especially at this altitude, so far above the tree line. How Noah’s Ark came to be at such great heights is easy to understand. The Bible describes the waters of the Flood as covering the earth’s highest mountain, thus allowing the ark to land on one such mountain. But there is also archaeological evidence that the Armenian plains have risen thousands of feet in historical times. This comes from vegetation found in archaeological remains on these highlands that now only grow at much lower altitude. It is likely that Mount Ararat, like many high mountains throughout the earth, has been growing and causing the rock slides that buried the Ark. “To make a long story short: this is all reported to be a fake,” said Randall Price, director of Judaic Studies at Liberty University in Lynchburg, Va.
Dr. Price was the archaeologist with the Chinese team in 2008 when the alleged discovery of the structure in a cave on the southwest side of Mt. Ararat was first made. He worked with this team for a month and obtained the same photos of the inside of the wooden structure now being distributed to support the alleged discovery. After the public announcement was made of this discovery in late April, Dr. Price issued a private communique giving his opinion concerning the discovery. This was sent exclusively to a select e-mail list of his ministry supporters and was not intended for the public. Unfortunately, this document was posted on the web without his authorization and has been widely quoted by various news sources to the effect that Dr. Price asserts the structure is a hoax perpetrated by the Kurdish guide and his partners to extort money from the Chinese evangelical Christians. While Dr. Price does not retract his statements, he wants the public to understand that these only represent his opinion as informed by his experience with the Kurdish guide and the Chinese and other sources in eastern Turkey. However, Dr. Price is currently working with his sources in eastern Turkey to obtain such documentation. Nevertheless, his primary source cannot be exposed to media scrutiny because an untimely exposure would compromise the plans and preparations for an expedition to Mt. Ararat in which he is involved as archaeologist this summer. Therefore, the only public statement he wishes to make at this time is that he believes that the greater the claim the greater the evidence needs to be to support it and urges the Chinese-Turkish team to make their collected samples from the structure available to scientists and scholars for comparative analysis. While he has reservations about the nature and procedure of the Chinese-Turkish expedition and the artifacts related to it, he believes that a decision concerning this matter must wait until independent examinations of the site and the structure can be made and published. In sum, Randall Price is only making innuendo. He explains his agenda: his remarks were directed to his ministry’s supporters. The public statement he wishes to make at this time is the glib advice of the skeptic David Hume, more often used to dispute the evidence for the resurrection of Jesus. Robert Cornuke’s charges are no less disturbing. One should know that Cornuke is responsible for the recent well-publicized announcement that the remains of Noah’s Ark may have been found in Iran. Thus, he is the promoter of a rival Noah’s Ark site vying for attention and sponsorship. When I first met Cornuke, I immediately asked whether he was associated with Ron Wyatt. “Not any more,” he replied. “Not since I discovered him fabricating chariot wheels.” [that Wyatt claimed to have found beneath the Red Sea.] Cornuke continued to relate additional incidences where he caught Wyatt fabricating archaeological evidence to sell to supporters and sponsors. I then asked Cornuke why he did not let the public know about the man they were supporting. Cornuke declared that his calling was not to expose the wrongdoing of others but to pursue archaeology in the interest of the truth of the Bible. He dismissed my protest that Wyatt was doing damage to the cause of Biblical archaeology. Apparently, Cornuke is no longer satisfied with his formerly high-minded approach to archaeological fraud. I trust that he will also make public what he told me in private about his former associate. Indeed it is not NAMI or the Turkish archaeological authorities who need most to be forthcoming with evidence, but those who are making these charges of fraud. In sum, we should not allow innuendo any more disturb what seems a wonderful and unexpected discovery. While most ark claims have been chiefly hype, NAMI is producing substance. Hype fades, but facts do not go away. There are of course many issues that have been raised against even the possibility of Noah’s Flood. These should likewise be decided by the evidence as I have done in my forthcoming book. Though the book focuses on the powerful archaeological evidence, I explain the geological [phenomena now explained as the “Ice Age” was formerly understood as due to the Flood], zoological [Ice Age extinctions, changes in distribution of animal species from the same era], genetic [the latest DNA studies pertaining to Neolithic and Paleolithic men versus present populations], and linguistic [showing the errors arising from nationalistic and religious influences in the development of this science] evidence that attest to the same truth. Truth needs no defense, but truth will defend. I had the pleasure of meeting you and NAMI at the National Apologetics Conference in Charlotte. I had already been in e-mail contact with Clara Wei and came away further impressed with the humility, sincerity, and credibility of this group. I met Randall Price several years ago. He struck me as arrogant even though I respected his work. He did us all a favor by challenging Ron Wyatt, but completely dismissing Wyatt was a mistake. He was on to something regarding the location of the real Mount Sinai as Ted Wright so ably demonstrated at the conference. Speaking of Ted, did you get a chance to meet him? He is chomping at the bit to climb Ararat with NAMI but doesn’t think he can manage the funds right now. His background as a professor of biblical archaeology at Southern Evangelical Seminary and mountain-climbing experience would make him a logical choice to join the team. I gave Clara Wei a humble donation. I have forwarded NAMI’s web site and yours to as many people at my church (Grace Brethren in Columbus, Ohio) as I think would be even remotely interested, and my pastor (Jim Custer) had me report to our very large Monday night bible study on NAMI’s presentation at the conference. I have had many inquiries since then. As you said after their presentation, NAMI “hit a home run”. What did they think of Ruth’s Chris steakhouse? Thank you for your generosity toward them and for all you are doing in the cause of Christ.